He has performed various plucked and bow instruments in various musical ensembles in Turkey, Europe and Asia. 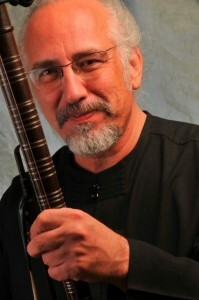 He has played in important music festivals domestically and internationally such as Istanbul Music Festival and collaborated with important musicians such as Ihsan Özgen by playing various instruments in his ensemble called “Anatolia.’ Between 1984-1985 he performed classical kemençe in the Istanbul Mayor’s Musical Interpretation Organization. After 1985, he dedicated himself to performing on the rebab. He improved and reconstructed the forgotten instrument and redefined it as “Refik-i Rebab” by playing challenging works of new expanded repertoire for this instrument. He has performed not only the most challenging works of Classical Turkish Music repertoire but also Western Classical Music. He recorded two Sufi Music Albums from Çağ Records in 1989 as wells as “Suzidilara Ayini” that he played every instrument in the album by himself, which was released by Kent Records. He has performed more than 500 concerts all around the world with his Sufi Music Ensemble. His live recording from Spain Murcia was released in Spain and titled as “Musica Sufi” in 1990. His album Ruhnüvaz (2005) that was released by Kalan Records reached to large audience in Turkey and abroad. His second album titled as Subh-u Seher included works by 17th century composers such as Ali Ufki and Prince Dimitrie Cantemir. He has performed as soloist with Cemal Reşit Rey Symphony Orchestra in pianist composer Tuluyhan Uğurlu’s work Senfoni Türk. The first rebab concerto was written by Ilyas Mirzayev and dedicated to Mr. Kaya. The world premiere of the concerto was performed by Mr. Kaya with Tekfen Philharmonic Orchestra in Istanbul. He has performed many concerts in United States with his guitarist son Celil Refik Kaya. He has been performing all around the world as part of the Istanbul Historical Music Ensemble since 1994 as well as conducting music therapy in Johns Hopkins Hospital of Istanbul. Dr. Kaya continues performing with various musicians with wide range of projects under the title of Ruhnüvaz Concerts.